Ioerger Creative and Silverback Marketing are teaming up to form a larger and more robust online marketing agency. Look for details and a full announcement shortly. We're based in the Phoenix metro area of Arizona but we're happy to work with any client regardless of location. Nearly every business, large or small, that has a web presence eventually arrives at a point where it needs help taking the next step in its online evolution. 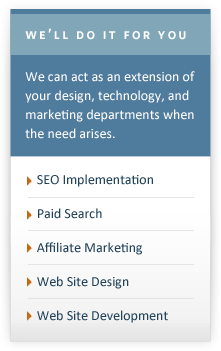 We are a consulting firm that engages with businesses to help turn their goals into actionable and easily understood internet marketing plans. Sometimes all a business needs is a plan. Whether it is solving a single issue such as improving web site conversion or addressing a more complicated task such as creating a multi-tiered internet marketing strategy designed to accomplish various objectives. We have the experience, understanding and resources to be able to help devise the best possible solutions. Occasionally having an internet marketing plan just isn’t enough. When a business has a strategy that they are comfortable with but does not have the personnel and or in-house experience to be able to effectively execute, they can turn to us and we can bring our assets into play to help fill in any resource shortfalls they may have. Every solution we develop is unique to the individual business. There is no such thing as “one size fits all” when it comes to internet marketing strategies. While some marketing tactics may appear similar each business has its own particular requirements that must be understood before a sound strategy can be defined. By taking the time to listen to and educate our clients, we set ourselves apart in making sure that every step of the process is transparent and clearly understood. 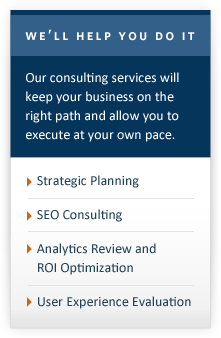 As a consulting firm our primary objective is to always help our clients achieve their goals. Along the way, we work to make sure that when a project is completed, our clients have the knowledge to be able to support, maintain, and manage the project long-term so that they can walk away from a project not feeling beholden to their agency. Roderick Ioerger was most recently a guest speaker at SuiteWorld 2011 in San Francisco, CA. Roderick along with a panel of search experts and one extremely successful NetSuite customer discussed SEO and its direct impact on NetSuite e-commerce customers. ©2010 Ioerger Creative All Rights Reserved.